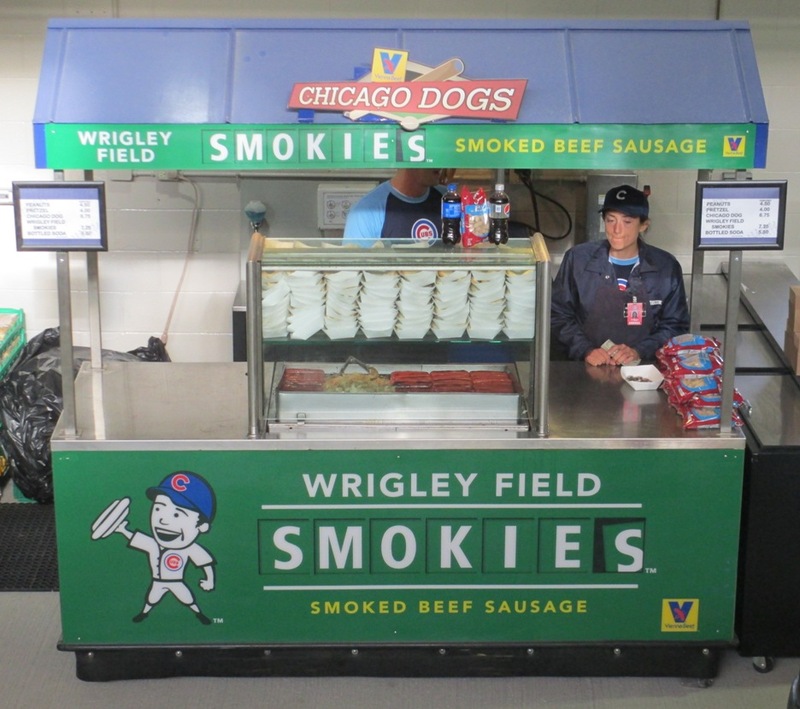 Since Chicago is a hot dog city, I’ve listed a few choices for excellent choices of hot dogs and sausages available at the Cubs ballpark. But Chicago isn’t a one-trick culinary pony, and you have plenty of other great choices of Wrigley Field food. True, I don’t want to watch someone else eat this. 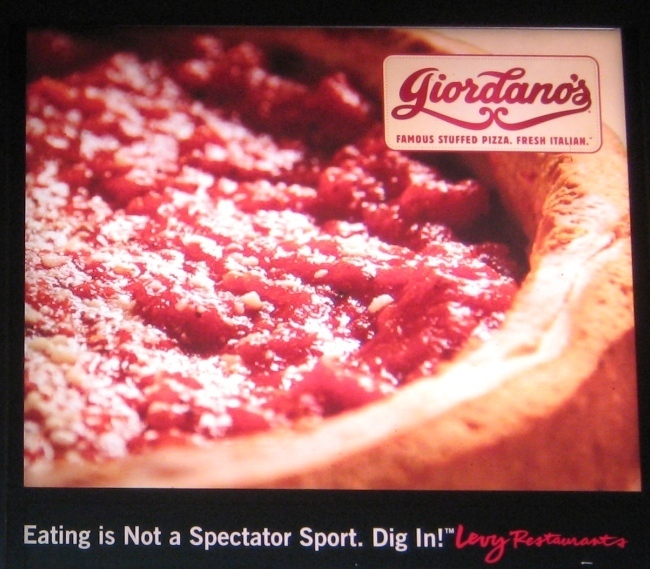 Wrigley Field Food, Tip #1) Giordano’s Pizza. I’m a huge fan of Giordano’s, and you haven’t enjoyed a taste of Chicago until you’ve tried a deep dish pizza. At Wrigley, you can find a nice sized personal pizza at the Blue W and other generic stands (it’s easy enough to find). You can order a 6-inch stuffed pizza, and it’s filling and reasonable for ballpark prices. I would get a fork for it. They have a thin crust variation at some stands, if you’re keeping some space for that footlong Decade Dog. Giordano’s even has chefs on the premises. They don’t mess around with their good name. It’s like they set up a whole stage for this thing, isn’t it? Wrigley Field Food, Tip #2) The Pig Candy BLT. Pork & Mindy’s is a Bucktown-area joint known for its creative barbecue sandwiches…not just for slow-smoked meat but for some truly inventive toppings. 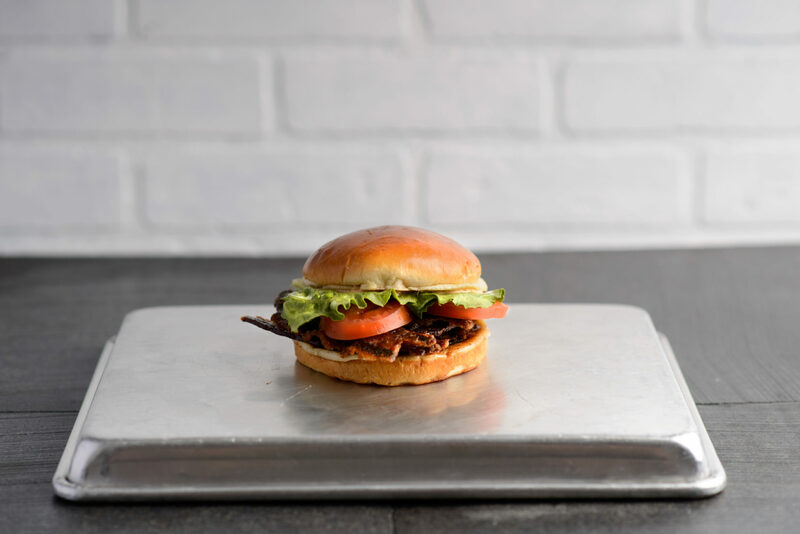 In 2017 the Cubs added a few of the more popular Pork & Mindy’s sandwiches to the menu in the Bleachers; the aforementioned Pig Candy BLT features brown sugar bacon, lettuce, tomato, dry rub mayo and balsamic caramelized onions. (You had me at brown sugar bacon.) Did I mention the griddle brioche bun? Folks, this is why we love baseball. As far as I know, the Pig Candy BLT is only available in the bleachers; correct me if I’m wrong on that. Wrigley Field Food, Tip #3) The North Side Twist. 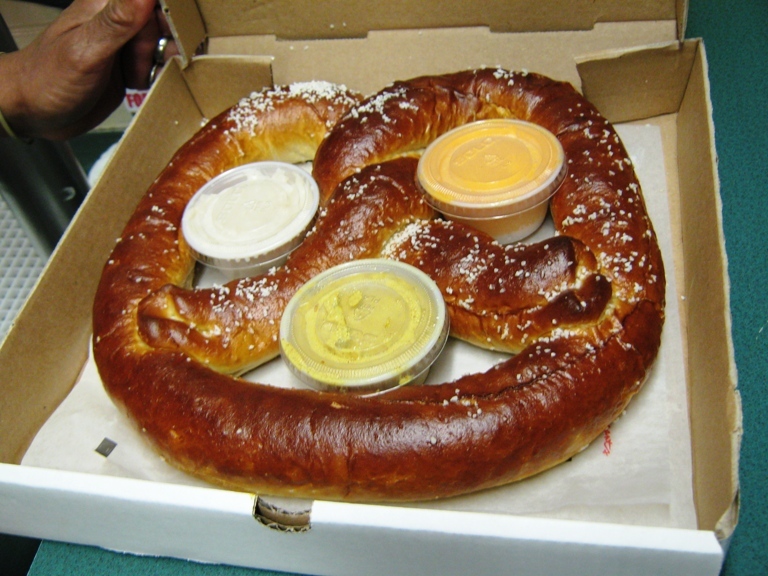 The North Side Twist is a HUGE soft pretzel…large enough to go into a 12” pizza box. If you’re thinking you could handle this thing on your own, know that it’s two pounds, not including the dipping sauces, and it’s easily enough for two. Ah…the dipping sauces. The cornerstone of a good soft pretzel. The sauces included with the North Side Twist are chipotle honey mustard, beer cheddar cheese, and cinnamon cream. You can use two thirds of it with the other sauces before going for the cinnamon cream for dessert. The North Side Twist shouldn’t be too tough to find. They often have it on display in its full glory at Blue W or other stands. I believe you can get it in the Bleachers as well. You don’t need to know how to spell “giardiniera”. Just how to pronounce it. Wrigley Field Food, Bonus Tip!) Al’s Italian Beef (on Clark Street). There’s nothing wrong with the Buona beef edition of Wrigley Field’s Italian beef (Chicagoans tell me not to include the word “sandwich”), but before you try it, you should go for the true staple of Italian beef in Chicago…Al’s on Clark Street in Wrigleyville, just a few blocks south of the ballpark. 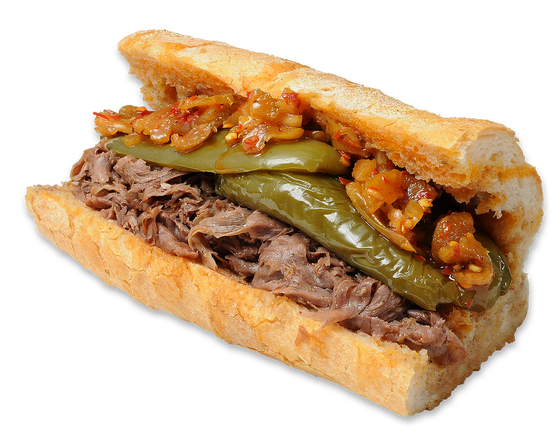 The sandwich…sorry, Italian beef…here is a sandwich of thinly sliced beef with hot peppers and/or spicy giardiniera, and you can get it with any amount of au jus gravy, including having the whole sandwich dipped in it. It’s also probably a little cheaper than what you’d pay for such a delight at the ballpark. Al’s photo courtesy of Al’s Italian Beef. Pig Candy BLT photo courtesy of Pork & Mindy’s.